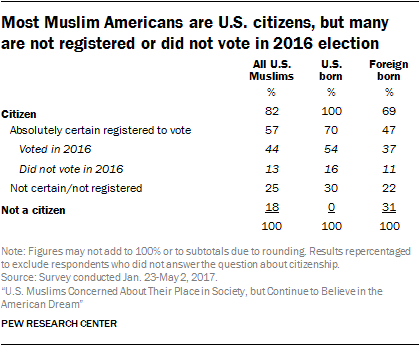 The political profile of Muslim Americans is much the same today as it was when Pew Research Center first comprehensively surveyed this population a decade ago: Muslims constitute a strongly Democratic constituency. Three-quarters of Muslim voters say they cast a ballot for Hillary Clinton in the 2016 presidential election, and two-thirds of U.S. Muslims overall say they disapprove of the way Donald Trump is handling his job as president. Most Muslims continue to hold the view that immigrants strengthen the U.S. because of their hard work and talents. And two-thirds say they would prefer to have a larger government that provides more services over a smaller government that provides fewer services. There has, however, been one notable change in the social and political views of U.S. Muslims: They have become much more accepting of homosexuality over the past decade, matching a similar shift that has occurred among the public overall. Indeed, the share of Muslim Americans who say homosexuality should be accepted by society has nearly doubled since 2007. Fully two-thirds of U.S. Muslims identify with or lean toward the Democratic Party (66%). Far fewer say they are Republican or lean Republican (13%), while one-in-five say they prefer another party or are political independents and do not lean toward either major party. Muslim Americans’ partisan composition is little changed over the last decade, and they remain much more strongly Democratic than the public as a whole. Muslims from a wide variety of social and demographic backgrounds express a preference for the Democratic Party over the GOP. Muslim adults of all ages, for example, heavily favor the Democratic Party. And attachment to the Democratic Party is strong among U.S.-born and foreign-born Muslims alike (67% and 66%, respectively). Muslim women are somewhat more likely than Muslim men to affiliate with the Democratic Party (73% vs. 59%). Just as they are much less Republican than the public as a whole, Muslims also are far less likely than other Americans to describe themselves as ideological conservatives. Just one-in-five Muslims (21%) describe their political views as “very conservative” or “conservative,” compared with 36% in the public overall who describe themselves this way. 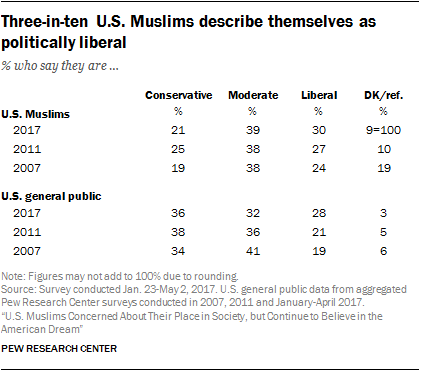 Muslims are not significantly more likely than all Americans to identify as liberal (30% vs. 28%); however, a greater share of Muslims describe themselves as politically moderate (39% vs. 32% of all U.S. adults). 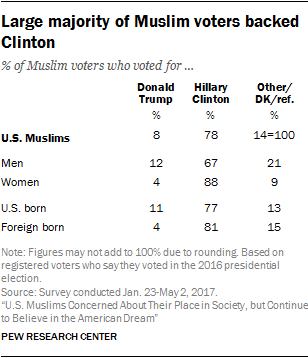 Muslims who voted in the 2016 presidential election overwhelmingly say they voted for Hillary Clinton over Donald Trump (78% vs. 8%). Support for Clinton was especially strong among Muslim women voters (88%). About two-in-ten U.S. Muslims overall (19%) say they approve of the way Trump is handling his job as president. Far more (65%) disapprove, and 16% express no opinion. Trump gets much lower marks from Muslims than Barack Obama did in 2011 (when 76% of Muslims approved of Obama’s performance) and roughly the same approval rating that George W. Bush received from Muslim Americans in 2007 (15%). Trump’s approval ratings are particularly low among U.S.-born black Muslims: Just 7% in this group approve of his job performance. The U.S. public is split over whether Islam is compatible with democracy. More than four-in-ten Americans (44%) say they think there is a natural conflict between the teachings of Islam and democracy, while a similar share say there is no conflict (46%). 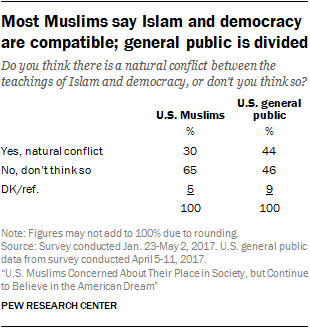 But most U.S. Muslims (65%) say there is no conflict between Islam and democracy, while three-in-ten say there is a conflict. Among those who see a conflict between Islam and democracy, about a quarter of Muslims (23%) and a similar share of all U.S. adults (22%) say Islam is not accepted in the U.S., which includes some in both groups who say non-Muslims do not have a sufficient understanding of Islam. U.S. Muslims hold more conservative views than the general public about homosexuality. But, like the population at large, Muslims have become noticeably more accepting of homosexuality over the last 10 years. Today, about half of U.S. Muslims say homosexuality should be accepted by society (52%), while 33% say homosexuality should be discouraged. By comparison, in 2011, 39% of Muslims said homosexuality should be accepted; in 2007, just 27% held this view. Just as in the general population, there is a strong generational component to Muslim Americans’ views about homosexuality. Young Muslims are more accepting of homosexuality than are older Muslims, with six-in-ten Muslim Millennials saying they think homosexuality should be accepted by society. But acceptance of homosexuality has increased among all generational cohorts; Muslims from the Baby Boom generation and older cohorts are today 18 percentage points more likely to accept homosexuality than they were in 2007. Indeed, acceptance of homosexuality has increased among many Muslim demographic groups analyzed. Women are more accepting than men, but both groups are much more accepting of homosexuality today than they were a decade ago. U.S.-born and foreign-born Muslims have both become more accepting of homosexuality over time. And Muslims who say religion is “very important” in their lives have become 28 points more accepting over the last decade. Muslim Americans view immigrants as a boon to the U.S.
Nearly eight-in-ten U.S. Muslims – many of them immigrants themselves – say immigrants “strengthen the U.S. because of their hard work and talents” (79%). Just 16% agree with the statement that immigrants “are a burden on the U.S. because they take our jobs, housing and health care.” These views have held relatively steady over the last decade. The view that immigrants strengthen American society is especially common among Muslim immigrants, 85% of whom take this position. But a solid majority of U.S.-born Muslims, including 78% of the second-generation children of immigrants, and 63% of those whose families have been in the U.S. for three generations or more, also say immigrants strengthen American society. The views of the latter group are in line with the opinions of U.S. adults overall: In 2016, 63% of American adults said immigrants strengthen America. U.S. Muslims today are as optimistic about a central component of the “American dream” —the idea that people can get ahead through hard work – as they were a decade ago. Seven-in-ten Muslims endorse the idea that most people can get ahead if they are willing to work hard (70%), while three-in-ten (29%) say hard work is no guarantee of success. U.S. Muslims are somewhat more likely than the public as a whole to say that most people who work hard can thrive. Most Muslim Americans continue to say they prefer a bigger government with more services over a smaller one with fewer services. Currently, 67% say they favor a larger government, while a quarter prefer a smaller one. Similar shares of Muslims said they preferred a bigger government in 2011 and 2007. Preference for a larger government is especially strong among Muslim immigrants (72%). By comparison, among Muslims who were born in the U.S., 58% say they would prefer a bigger government, while 32% would rather have a smaller government. Among the general public, views are more evenly divided. Nearly half of U.S. adults (48%) prefer a bigger government, while a similar share (45%) favor a smaller government.